Nathan Chen performs his Long Program at the 2015 U.S. Figure Skating Championships. While bad luck and injuries have plagued USA’s Nathan Chen this past year, the 2014 World Junior bronze medalist pushed through the season with grace and determination in his debut as a senior on the national level. Chen, who is coached by Rafael Arutyunyan and Nadia Kanaeva, has been struggling with a heel injury since last summer. During the first part of the season, he also sprained a muscle that connects the hip to the back. As a result, he opted out of one the Junior Grand Prix (JGP) events in hopes that he would have time recover for the second half of the season. Unfortunately, the heel injury became even more aggravated a week before his senior debut at the 2015 U.S. Figure Skating Championships. 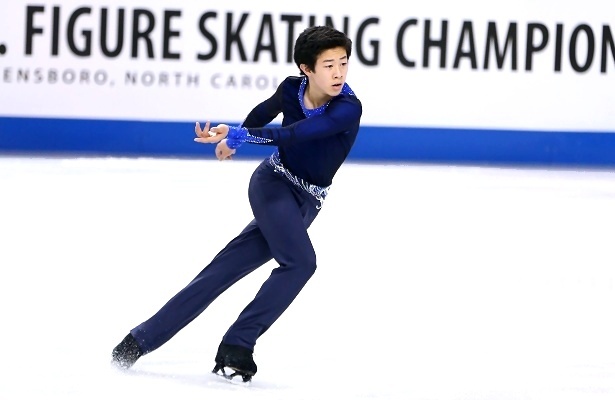 In Greensboro, Chen performed scaled-back versions of both his short and long program to place eighth in his senior debut at U.S. Nationals. Chen then took two weeks off to recover, but still wasn’t able to train as hard as he needed in order to prepare for the 2015 World Junior Figure Skating Championships. Although Chen felt better mentally going into Junior Worlds than nationals, he still felt he physically wasn’t ready. With the exception of a fall on the triple Axel and an edge call on the triple flip (in combination with a triple toe), the skater had a fairly solid short. He was awarded a level four on two of his spins, as well as his straight line footwork sequence, and finished ninth with 69.87 points. In the long, Chen stepped out of his opening quad toe, but managed to hang on to the landing of his second quad toe (in combination with a double toe). He went on to land six more triple jumps while showing good spins and footwork, placing fourth with 143.98 points. With a total score of 213.85 points, the skater just missed the podium by 1.6 points. Shortly after Junior Worlds, Chen went to the Olympic Training Center (OTC) in Colorado Springs, Colo., for four weeks where he underwent a great deal of rehabilitation as well as strength training. Since Junior Worlds, Chen has grown nearly two and half inches and believes that the growth plate in his heel will be completely healed in about a year. For the upcoming season, Chen will continue to use last year’s short program to Michael Jackson’s “Smile” and “Smooth Criminal” which was choreographed by Nadia Kanaeva. His new long program is to Saint-Saëns’ Symphonie No. 3 “avec orgue” and was choreographed by Nikolai Morozov. Chen recently debuted his new long at the 2015 Broadmoor Open, where he finished first; however, both programs were downgraded as it was the first competition of the season for the skater. In the short program, the skater landed a quad toe-triple toe and triple Lutz, but fell on his triple Axel. His long featured a quad toe and triple Axel in addition to six more triple jumps. His next competition is Glacier Falls which will be held later this month in Anaheim, Calif.